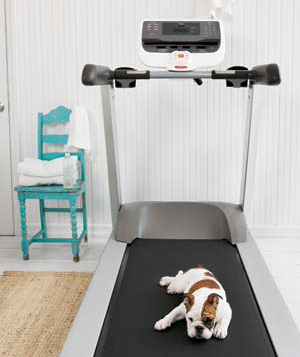 Pamela Reid, vice president of the ASPCA’s Animal-Behavior Center in Urbana, Illinois, recommends that dogs get at least 40 minutes of aerobic exercise daily. “Dogs need more exercise than people do,” says Reid. Try running or biking with your dog or playing fetch or Frisbee. With a cat, “you can’t take her jogging, but before and after work, give her 10 to 20 minutes of playtime,” says Reid. How to avoid it: Give your pets something to do. For a dog, that can mean having him hunt for food. Place a meal or treats in spots around the house for him to sniff out, or “feed him out of a food-dispensing puzzle toy instead of his bowl,” says Andrea Arden. Keep a cat engaged with simple amusements, like a toy mouse dangling from a string. “You can stimulate your cat visually by placing a bird feeder outside a window, or setting a lava lamp on a shelf,” says Arden Moore. How to avoid it: “Don’t leave a puppy alone for eight hours,” says Reid. Hire someone to watch him or drop him off at a doggie day-care center. Your puppy will need to learn how to be alone for a few hours each day, however, so “teach him to self-pacify almost immediately,” says Andrea Arden. Put him in a crate (or leash him to a stable object) a foot or two away from you, then gradually increase the distance over the course of a week. Then make sure that he spends escalating amounts of time alone in his crate or confined to a room. Break up the day for dogs of any age with a visit from a dog walker or a neighbor, and give your pet access to toys and visual stimuli. Unlike puppies, kittens can be left alone, but they should have access to toys and visual stimuli. How to avoid it: Location is key with a litter box. “A cat doesn’t want to travel a long way to go to the bathroom any more than you do,” says Mieshelle Nagelschneider, a feline behaviorist and a consultant at the Cat Behavior Clinic, near Portland, Oregon. Place litter boxes (one per cat, if you own a few, plus one box they can share, says Moore) in quiet areas throughout your home. Plug in a night-light beside each one so your cat can find it in the dark. Cats dislike strong odors (even air freshener), so use uncovered boxes and unscented litter and scoop out each box every day. Dogs are far less persnickety about where they relieve themselves, but do them the favor of regularly picking up the poop in the backyard. 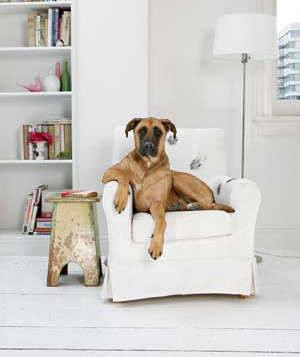 Cats and dogs also need spots where they can cuddle up and feel safe. “A dog needs a crate like a teenager needs a room,” says Dodman. Provide a crate or a cozy bed, and make it taboo for your family to pester the dog while he’s in it. Cats naturally want to climb to an optimal vantage point, so set up a place where yours can look out a window. How to avoid it: Never physically punish your pet; he’ll just learn to fear you. It’s OK to startle a pet out of a behavior, but only if you catch him in the act. Command him with a firm “No!” or “Down!” and he’ll connect the reaction with what he’s doing and learn that it’s not OK. Otherwise, the punishment should come from the environment. Teach a cat or a dog to stay off the counter, say, by arranging sheet pans in a pile that will clatter to the floor if he jumps up. The counter, not you, will become the thing to fear.